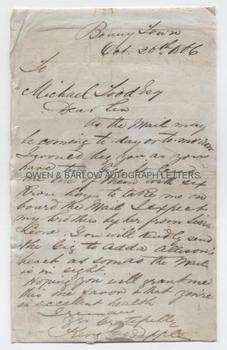 GEORGE PEPPLE Autograph Letter Signed. Ruler of the Kingdom of Bonny, an independant trading state in the Niger Delta, now part of Nigeria. ALS. 1p and integral blank. Bonny Town. October 20th 1866. To Michael Todd Esq. "As the mail may be coming today or tomorrow I would beg you as you have two gigs to lend me one of them with six Krou [?] boys to take me on board the mail. I expect my brothers by her from Sierra Leone. You will kindly send the gig to Adda Allison's beach as soon as the mail is in sight. Hoping you will grant me this one favour and that you're in excellent health. I remain yours faithfully, King George Pepple." 8vo. Approx 8 x 5 inches. Backed onto paper with mounting traces to verso and with paper piece attached to verso annotated "Letter and signature of King Geo Pepple, present King of Bonny - educated in England". Some creasing. Very Good. Bonny, or Bonny Town, was an ancient independent state on the Niger Delta. It had been important as a slave trading state and, after 1806, it had turned to the trading of palm oil and other commodities. The Pepple family had been the hereditary rulers for many years but in 1854 King William Pepple was deposed by the British and sent into exile in England. His infant son, George, also exiled, was educated in Bexley, Kent. During the period of exile, Bonny was torn by a bitter struggle between two rival factions of the Pepple family. The Manilla Pepple faction, led by Oko Jumbo and the Annie Pepple faction led by Chief Jubo Jabogha (known as Ja Ja). The British restored William Pepple to the throne of Bonny in 1861 and he ruled until his death in 1866. He was succeeded by George Pepple who, having been converted to Christianity whilst in England, outlawed the Bonny tribal religions and the worshipping of the iguana. Tensions between the two factions revived and turned to all-out war. At one point, George Pepple is said to have restored temporary order by roaming the waterfront with a pistol, threatening to personally shoot the ring-leaders. The continuation of the war threatened the palm-oil trade and peace was eventually restored to the kingdom by the intervention of a British gun-boat. George Pepple's friendship with the British, however, led to him being deposed by his own people, led by Oko Jumbo, who declared himself king. In 1886 a protectorate treaty was concluded between Britain and Bonny. A ruling council was established and George Pepple was restored to the throne. Oko Jumbo was publicly degraded and his bans on Christianity were repealed. 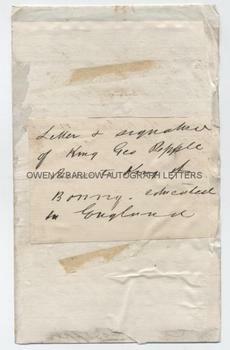 King George Pepple died in 1888. Letters of George Pepple are exceedingly rare. From a 19th century family album compiled by Gladys Margaret Coles, the daughter of Frederick W. Coles, an East India merchant of The Cedars, Epsom. Frederick Coles was the son of the East India Company trader, Richard Cooke Coles (1812-1888) and Elizabeth Regina Kreett, only daughter of Christopher Kreett, a British diplomat and Consul-General.